If you are looking for a Tulip with a difference then Tulip “Red Riding Hood” could be it. The botanical name is Tulipa greigii “Red Riding Hood” and it has been around for over 70 years. Most popular as a potted specimen where the attractive foliage as well as the red flowers prolong the season of interest. The large crimson red flowers with a very dark crimson blotch in the centre are attractive enough on their own, however the foliage is also interesting. Green marked with a purple variegation make this one of the only tulips we would grow for the foliage. This is a Tulipa greigii hybrid and is low growing to less than .3m. Easily grown in a container where they look great in flower as well as after because of the foliage. These bulbs need to be planted around 12cm (5 inches) deep in a humus rich moist but well drained soil. As it is a hybrid you may wish to remove the spent flower heads to prevent self seeding, this also make the foliage look good for longer. Grows well in full sun to afternoon shade and a little liquid fertiliser when growth first appears in early spring seems adequate. 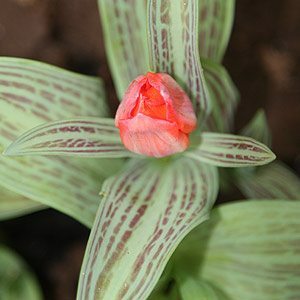 Although Tulip “Red Riding Hood” is a hybrid tulip it seems fairly tough, so you can try leaving it in the ground rather than digging it each year. This is an early flowering variety and does not need to be dug each year, so very easy care.